In Japanese, it is called chanoyu (茶の湯) or sadō, chadō (茶道), while the manner in which it is performed, or the art of its performance, is called (o)temae ([お]手前; [お]点前). Zen Buddhism was a primary influence in the development of the Japanese tea ceremony. Much less commonly, Japanese tea ceremony uses leaf tea, primarily sencha, in which case it is known in Japanese as senchadō (煎茶道, the way of sencha) as opposed to chanoyu or chadō; see sencha tea ceremony, below. The custom of drinking tea, first for medicinal, and then largely also for pleasurable reasons, was already widespread throughout China. In the early 9th century, Chinese author Lu Yu wrote The Classic of Tea, a treatise on tea focusing on its cultivation and preparation. Lu Yu's life had been heavily influenced by Buddhism, particularly the Zen–Chán school. His ideas would have a strong influence in the development of the Japanese tea ceremony. This powdered green tea was first used in religious rituals in Buddhist monasteries. By the 13th century, when the Kamakura Shogunate ruled the nation and tea and the luxuries associated with it became a kind of status symbol among the warrior class, there arose tea-tasting (ja:闘茶, tōcha) parties wherein contestants could win extravagant prizes for guessing the best quality tea—that grown in Kyoto, deriving from the seeds that Eisai brought from China. 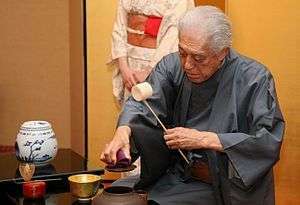 The Japanese tea ceremony developed as a "transformative practice", and began to evolve its own aesthetic, in particular that of "sabi" and "wabi" principles (see Wabi-sabi). "Wabi" represents the inner, or spiritual, experiences of human lives. Its original meaning indicated quiet or sober refinement, or subdued taste "characterized by humility, restraint, simplicity, naturalism, profundity, imperfection, and asymmetry" and "emphasizes simple, unadorned objects and architectural space, and celebrates the mellow beauty that time and care impart to materials." "Sabi," on the other hand, represents the outer, or material side of life. Originally, it meant "worn," "weathered," or "decayed." Particularly among the nobility, understanding emptiness was considered the most effective means to spiritual awakening, while embracing imperfection was honoured as a healthy reminder to cherish our unpolished selves, here and now, just as we are—the first step to "satori" or enlightenment. Murata Jukō is known in chanoyu history as an early developer of tea ceremony as a spiritual practice. 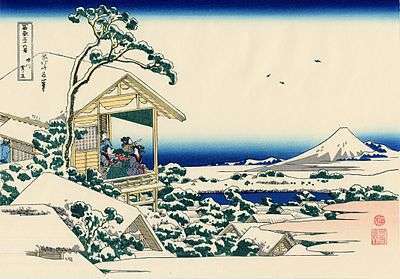 He studied Zen under the monk Ikkyū, who revitalized Zen in the 15th century, and this is considered to have influenced his concept of chanoyu. By the 16th century, tea drinking had spread to all levels of society in Japan. Sen no Rikyū and his work Southern Record, perhaps the best-known—and still revered—historical figure in tea ceremony, followed his master Takeno Jōō's concept of ichi-go ichi-e, a philosophy that each meeting should be treasured, for it can never be reproduced. His teachings perfected many newly developed forms in architecture and gardens, art, and the full development of the "way of tea". The principles he set forward—harmony (和, wa), respect (敬, kei), purity (清, sei), and tranquility (寂, jaku)—are still central to tea ceremony. While a purpose-built tatami-floored room is considered the ideal venue, any place where the necessary implements for the making and serving of the tea can be set out and where the host can make the tea in the presence of the seated guest(s) can be used as a venue for tea. For instance, a tea gathering can be held picnic-style in the outdoors (this is known as nodate (野点). 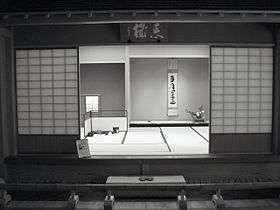 A purpose-built room designed for the wabi style of tea is called a chashitsu, and is ideally 4.5 tatami in floor area. It has a low ceiling; a hearth built into the floor; an alcove for hanging scrolls and placing other decorative objects; and separate entrances for host and guests. It also has an attached preparation area known as a mizuya. A 4.5-mat room is considered standard, but smaller and larger rooms are also used. Building materials and decorations are deliberately simple and rustic in wabi style tea rooms. Chashitsu can also refer to free-standing buildings for tea ceremony. 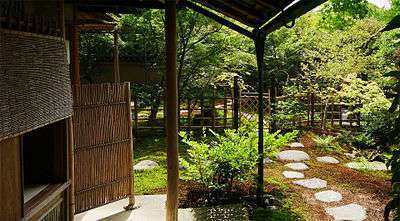 Known in English as tea houses, such structures may contain several tea rooms of different sizes and styles, dressing and waiting rooms, and other amenities, and be surrounded by a tea garden called a roji. Seasonality and the changing of the seasons are important in tea ceremony. Traditionally the year is divided by tea practitioners into two main seasons: the sunken hearth (炉, ro) season, constituting the colder months (traditionally November to April), and the brazier (風炉, furo) season, constituting the warmer months (traditionally May to October). For each season, there are variations in the temae performed and utensils and other equipment used. Ideally, the configuration of the tatami in a 4.5 mat room changes with the season as well. There are two main ways of preparing matcha for tea ceremony: thick (濃茶, koicha) and thin (薄茶, usucha), with the best quality tea leaves used in preparing thick tea. Historically, the tea leaves used as packing material for the koicha leaves in the tea urn (茶壺, chatsubo) would be served as thin tea. 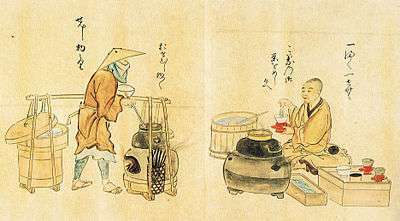 Japanese historical documents about tea ceremony that differentiate between usucha and koicha first appear in the Tenmon era (1532–55). The first documented appearance of the term koicha is in 1575. 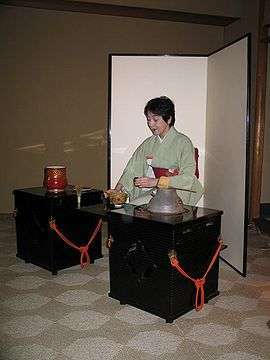 Tea equipment is called chadōgu (茶道具). A wide range of chadōgu are available and different styles and motifs are used for different events and in different seasons. All the tools for tea ceremony are handled with exquisite care. They are scrupulously cleaned before and after each use and before storing, and some are handled only with gloved hands. Some items, such as the tea storage jar "Chigusa," were so revered that they were given proper names like people, and were admired and documented by multiple diarists. Tea caddy (棗, Natsume). 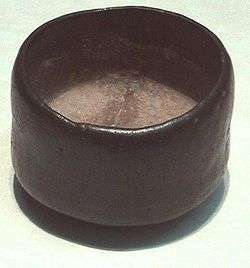 The small lidded container in which the powdered tea is placed for use in the tea-making procedure ([お]手前; [お]点前; [御]手前, [o]temae). The host then collects the utensils, and the guests leave the tea house. The host bows from the door, and the ceremony is over. A tea ceremony can last up to four hours, depending on the type of ceremony performed, the number of guests, and the types of meal and tea served. Each action in sadō - how a kettle is used, how a teacup is examined, how tea is scooped into a cup - is performed in a very specific way, and may be thought of as a procedure or technique. The procedures performed in sadō are called, collectively, temae. The act of performing these procedures during a chaji is called "doing temae". Chabako temae (茶箱手前) is so called because the equipment is removed from and then replaced into a special box known as a "chabako" (茶箱, lit. "tea box"). Chabako developed as a convenient way to prepare the necessary equipment for making tea outdoors. 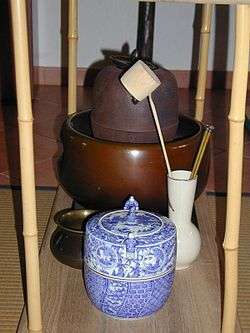 The basic equipment contained in the chabako are the tea bowl, tea whisk (kept in a special container), tea scoop and tea caddy, and linen wiping cloth in a special container, as well as a container for little candy-like sweets. Many of the items are smaller than usual, to fit in the box. This ceremony takes approximately 35–40 minutes. Calligraphy, mainly in the form of hanging scrolls, plays a central role in tea ceremony. Scrolls, often written by famous calligraphers or Buddhist monks, are hung in the tokonoma (scroll alcove) of the tea room. They are selected for their appropriateness for the occasion, including the season and the theme of the particular get-together. Calligraphic scrolls may feature well-known sayings, particularly those associated with Buddhism, poems, descriptions of famous places, or words or phrases associated with tea ceremony. Historian and author Haga Kōshirō points out that it is clear from the teachings of Sen no Rikyū recorded in the Nanpō roku that the suitability of any particular scroll for a tea gathering depends not only on the subject of the writing itself but also on the virtue of the writer. Further, Haga points out that Rikyū preferred to hang bokuseki (lit., "ink traces"), the calligraphy of Zen Buddhist priests, in the tea room. A typical example of a hanging scroll in a tea room might have the kanji 和敬清寂 (wa-kei-sei-jaku, lit. "harmony", "respect", "purity", and "tranquility"), expressing the four key principles of the Way of Tea. Some contain only a single character; in summer, 風 (kaze, lit. "wind") would be appropriate. Hanging scrolls that feature a painting instead of calligraphy, or a combination of both, are also used. Scrolls are sometimes placed in the waiting room as well. Chabana (literally "tea flower") is the simple style of flower arrangement used in tea ceremony. Chabana has its roots in ikebana, an older style of Japanese flower arranging, which itself has roots in Shinto and Buddhism. Chabana evolved from the "free-form" style of ikebana called nageire (投げ入れ, "throw (it) in"), which was used by early tea masters. Chabana is said, depending upon the source, to have been either developed or championed by Sen no Rikyū. He is said to have taught that chabana should give the viewer the same impression that those flowers naturally would give if they were [still] growing outdoors, in nature. Unnatural or out-of-season materials are never used. Also, props and other devices are not used. 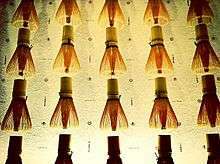 The containers in which chabana are arranged are referred to generically as hanaire (花入れ). Chabana arrangements typically comprise few items, and little or no filler material. In the summer, when many flowering grasses are in season in Japan, however, it is seasonally appropriate to arrange a number of such flowering grasses in an airy basket-type container. 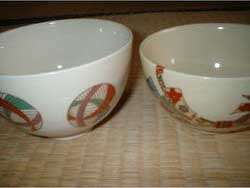 Unlike ikebana (which often uses shallow, wide dishes), tall, narrow hanaire are frequently used in chabana. The containers for the flowers used in tea rooms are typically made from natural materials such as bamboo, as well as metal or ceramic, but rarely glass. 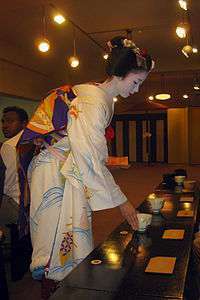 Many of the movements and components of tea ceremony evolved from the wearing of kimono; and, although it is not uncommon for students nowadays to wear western clothes for practice, most will practice in kimono at least some of the time, as this is essential to learn the prescribed motions properly. On formal occasions the host—male or female—always wears a kimono. Proper attire for guests is kimono or western formal wear. Most practitioners own at least one kimono suitable for wearing when hosting or participating in tea ceremonies. For both men and women, the attire worn at a tea ceremony—whether traditional kimono or other clothing—is usually subdued and conservative, so as not to be distracting. Women wear various styles of kimono depending on the season and the event; women generally do not wear hakama for tea ceremony, and do not gain the right to wear a jittoku. The Japanese traditional floor mats tatami are used in various ways in tea ceremony. 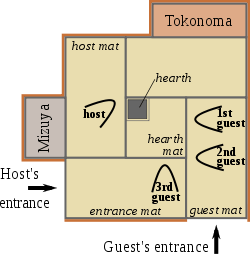 Their placement, for example, determines how a person walks through the tea room chashitsu, and the different seating positions. 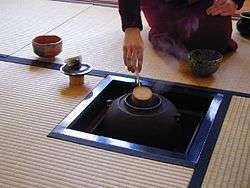 The use of tatami flooring has influenced the development of tea ceremony. For instance, when walking on tatami it is customary to shuffle, to avoid causing disturbance. Shuffling forces one to slow down, to maintain erect posture, and to walk quietly, and helps one to maintain balance as the combination of tabi and tatami makes for a slippery surface; it is also a function of wearing kimono, which restricts stride length. One must avoid walking on the joins between mats, one practical reason being that that would tend to damage the tatami. Therefore, tea students are taught to step over such joins when walking in the tea room. There are dozens of real and imaginary lines that crisscross any tearoom. These are used to determine the exact placement of utensils and myriad other details; when performed by skilled practitioners, the placement of utensils will vary minutely from ceremony to ceremony. The lines in tatami mats (畳目, tatami-me) are used as one guide for placement, and the joins serve as a demarcation indicating where people should sit. In Japan, those who wish to study the tea ceremony typically join what is known in Japanese as a "circle", which is a generic term for a group that meets regularly to participate in a given activity. There are also tea clubs at many junior and high schools, colleges and universities. As they master the basics, students will be instructed on how to prepare the powdered tea for use, how to fill the tea caddy, and finally, how to measure the tea and water and whisk it to the proper consistency. Once these basic steps have been mastered, students begin to practice the simplest temae, typically beginning with O-bon temae (see above). Only when the first ceremony has been mastered will students move on. Study is through observation and hands on practice; students do not often take notes, and many teachers discourage the practice of note-taking. As they master each ceremony, some schools and teachers present students with certificates at a formal ceremony. According to the school, this certificate may warrant that the student has mastered a given temae, or may give the student permission to begin studying a given temae. Acquiring such certificates is often very costly; the student typically must not only pay for the preparation of the certificate itself and for participating in the ceremony during which it is bestowed, but is also expected to thank the teacher by presenting him or her with a gift of money. The cost of acquiring certificates increases as the student's level increases. Typically, each class ends with the whole group being given brief instruction by the main teacher, usually concerning the contents of the tokonoma (the scroll alcove, which typically features a hanging scroll (usually with calligraphy), a flower arrangement, and occasionally other objects as well) and the sweets that have been served that day. Related topics include incense and kimono, or comments on seasonal variations in equipment or ceremony. Like the formal art surrounding matcha, there is a formal art surrounding sencha, which is distinguished as senchadō (煎茶道, the way of sencha). Generally it involves the high-grade gyokuro class of sencha. This ceremony, more Chinese in style, was introduced to Japan in the 17th century by Ingen, the founder of the Ōbaku school of Zen Buddhism, which is in general more Chinese in style than earlier schools. In the 18th century, it was popularized by the Ōbaku monk Baisao, who sold tea in Kyoto, and later came to be regarded as the first sencha master. It remains associated with the Ōbaku school, and the head temple of Manpuku-ji hosts regular sencha tea ceremony conventions. 1 2 3 Tsuitsui Hiroichi. "Koicha". Japanese online encyclopedia of Japanese Culture (in Japanese). Retrieved 2012-07-13. ↑ Kaisen Iguchi; Sōkō Sue; Fukutarō Nagashima, eds. (2002). "Eichū". Genshoku Chadō Daijiten (in Japanese) (19 ed.). Tankōsha (ja:淡交社). OCLC 62712752. ↑ Kaisen Iguchi; Sōkō Sue; Fukutarō Nagashima, eds. (2002). "Eisai". Genshoku Chadō Daijiten (in Japanese) (19 ed.). Tankōsha (ja:淡交社). OCLC 62712752. ↑ Yuki. 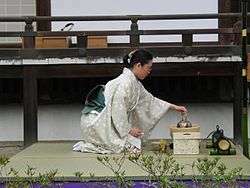 "The Origin of Japanese Tea Ceremony". Matcha Tea. Retrieved 14 November 2015. ↑ Han Wei (1993). "Tang Dynasty Tea Utensils and Tea Culture" (PDF). Chanoyu Quarterly. Kyoto: Urasenke Foundation of Kyoto (74): 38–58. OCLC 4044546. Archived from the original on 2012-07-05. Retrieved 2012-07-05. ↑ Sen Sōshitsu XV (1998). The Japanese way of tea: from its origins in China to Sen Rikyū. Trans. Dixon Morris. Honolulu: University of Hawai'i Press. pp. V. ISBN 0-8248-1990-X. Retrieved 2012-07-05. ↑ "Chado, the Way of Tea". Urasenke Foundation of Seattle. Retrieved 2012-07-13. ↑ Taro Gold (2004). Living Wabi Sabi: The True Beauty of Your Life. Kansas City, MO: Andrews McMeel Publishing. pp. 19−21. ISBN 0-7407-3960-3. ↑ Kaisen Iguchi; Sōkō Sue; Fukutarō Nagashima, eds. (2002). "Jukō". Genshoku Chadō Daijiten (in Japanese) (19 ed.). Tankōsha (ja:淡交社). OCLC 62712752. ↑ Rupert Cox - The Zen Arts: An Anthropological Study of the Culture of Aesthetic 2013 1136855580 "Jaku is significantly different from the other three principles of the chado: wa, kei and set. These all substantiate the normative procedures of chado. Jaku, on the other hand, is pure creation. " ↑ Tsuitsui Hiroichi. "Usucha". Japanese online encyclopedia of Japanese Culture (in Japanese). Retrieved 2012-07-13. ↑ "Sequential photos of kaiseki portion of an actual chaji" (in Japanese). Archived from the original on 2011-07-22. ↑ Haga Koshiro (1983). "The Appreciation of Zen Scrolls" (PDF). Chanoyu Quarterly. Kyoto: Urasenke Foundation of Kyoto (36): 7–25. OCLC 4044546. Archived from the original on 2012-07-05. Retrieved 2012-07-05. ↑ "Chabana Exhibition (27 May)". Embassy of Japan in the UK. 2006. Retrieved 2012-07-13.